is one of the many ways we’re continuing to bring you the most comprehensive and accurate maps of the world. In this month’s update, you’ll find another extensive refresh to our high resolution aerial and satellite imagery (viewable in both Google Maps and Google Earth), as well as new 45 degree imagery in Google Maps spanning 30 new cities. Google Maps and Earth now feature updated aerial imagery for more than 20 locations, and updated satellite imagery for more than 60 regions. Here are a few interesting locations included in our latest release. 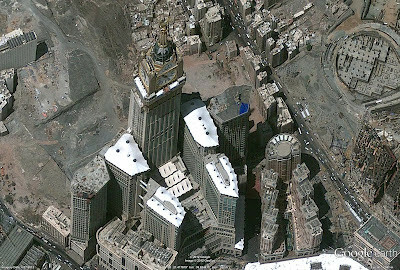 Below is imagery of Mecca, Saudi Arabia where each year more than 15 million Muslims visit this important religious site. Here you can see Abraj Al Bait, one of the world largest clock towers, visible even from space! On the opposite side of the globe, baseball season in the United States is in full swing and fans can’t get enough. 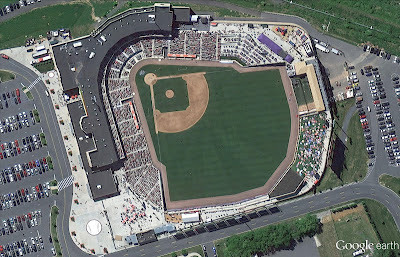 Below is an aerial image of Coca-Cola Park in Pennsylvania, home of the Lehigh Valley IronPigs, a minor league affiliate of the Philadelphia Phillies. In addition, this month’s Google Maps update includes 45° imagery coverage for 23 U.S. cities and 7 international locations. Below are some highlights from Bordeaux, France and Cincinnati, Ohio. Bordeaux is a major city in southwestern France, located roughly 45 kilometers from the Atlantic Ocean. It is especially famous for its wine and cuisine, and the image below shows the Gothic style Saint-André Cathedral. Cincinnati, Ohio, was the first major inland city in the United States known for its large collection of historic architecture . Below is the Over-The-Rhine neighborhood, which exemplifies the historic Italianate Architecture that can be found throughout Cincinnati. Below is the full list of cities boasting new or updated imagery. United States: Bend, OR; Bloomington, IN; Buffalo, NY; Cincinnati, OH; Columbus, IN; Columbus, OH; Conway, SC; Evansville, IN; Fort Wayne, IN; Gastonia, NC; Hamilton, OH; Indianapolis, IN; Jackson, TN; Joliet, IL; Kokomo, IN; Lincoln, NE; Louisville, KY; Mankato, MN; Muncie, IN; Owensboro, KY; Palm Valley, FL; Rochester, MN; Wilmington, NC. International: Béziers, France; Bordeaux, France; Lille, France; Marseille, France; St. Etienne, France; Platja d'Aro, Spain; Blanes, Spain. If you’d like to receive an email notification when imagery for the areas you care about are updated, check out the Follow Your World tool. Enjoy the new sites! Update (9/7): Satellite and aerial image mentioned is currently available in Google Earth only and will be coming to Google Maps shortly. Improving the availability of more high quality imagery is one of the many ways we’re continuing to bring you the most comprehensive and accurate maps of the world. In this month’s update, you’ll find another extensive refresh to our high resolution aerial and satellite imagery (viewable in both Google Maps and Google Earth), as well as new 45 degree imagery in Google Maps spanning 30 new cities.